Contributions by Victor Zamudio Taylor, Elizabeth Armstrong. Text by Paulo Herkenhoff, Serge Gruzinski. This in-depth look at Latin American art explores the complexity of the contemporary aesthetic and cultural milieu in this vast and diverse region of the world, focusing on a critical re-reading of the Baroque in Latin America and its curious function as an important cultural metaphor. The diversity of artists represented--hailing from South America, Mexico, the Caribbean, and the United States--serves to critique and recuperate this concept of the Baroque that has become increasingly clichéd and misunderstood. 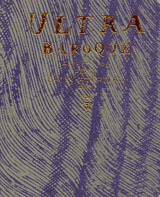 With art by Ruben Ortiz Torres, Miguel Calderon, Rochelle Costi, Arturo Duclos, Carlos Garaica, Meyer Vaisman, Yishai Jusidman, Iìigo Manglano-Ovalle, La Menna Barreto and Franco Mondini Ruiz among many others, Ultrabaroque proposes a fresh angle on Latin American art. Paperback, 9.5 x 11 in. / 221 pgs / 60 color / 15 bw. Published by Presentation House Gallery. Contributions by Elizabeth Armstrong, Sebastian Rotella, Dot Tuer. Paperback, 11.5 x 9 in. / 120 pgs / 46 duotone.